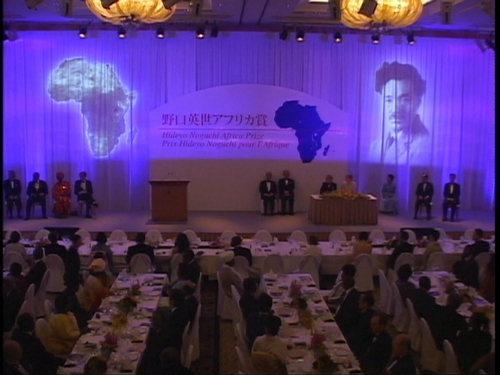 The inaugural ceremony of "Hideyo Noguchi Africa Prize" was held in the evening of May 28th, the first day of TICAD 4, in the presence of Emperor and Empress. Dr. Greenwood and Dr. 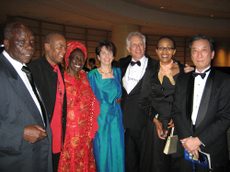 Were, the winners of the award, are great people who have embodied the spirit of Hideyo Noguchi. They are both very modest and friendly. Such a great work performed by husbands and wives, supporting and helping each other in Africa for a period of more than 30 years is very respectable. As a selection committee chairman, I am happy from the bottom of my heart that we are able to present to the world with great pride this excellent selection result. The head of states and chief of government of more than 40 countries from Africa have participated in this celemony and it was really a refreshing and pleasant reception that reflected the personality of both of them. 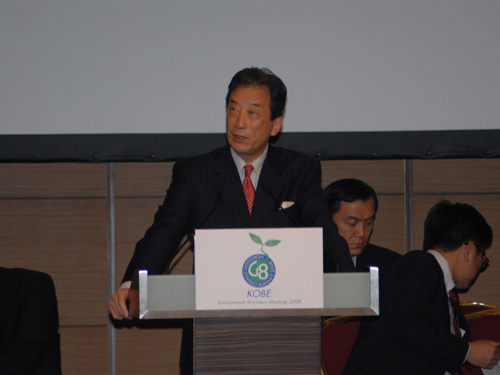 Former Prime Minister Mr. Koizumi, as a founder of this award, greeted everyone and said, "It seems that, today the spirit of Dr. Noguchi has come down over all the people in this assembly hall." We came to know afterwards that this was an improvisation and was not in the original draft. It’s a good expression, isn’t it? There really was that sort of an atmosphere in the entire assembly hall. Next day in the afternoon, Dr. Greenwood and Dr. 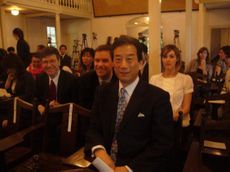 Were both gave speech at the United Nations University at Aoyama. Ms. Doden of NHK led panel of three (myself and the two) which was also good. After that, they went to visit Inawashiro, the birthplace of Hideyo Noguchi. There was a grand welcome in Inawashiro. 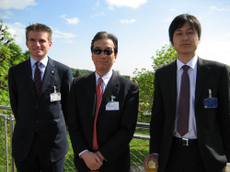 Details are written in the Blog of Mr. Kanke, Mayor of Aizu Wakamatsu city (29th May, 30th May). I imagine that they learned something new about Hideyo Noguchi at the actual place of his upbringing. The winners and their family enjoyed the visit, I hear. For a moment, I felt much closer to Africa again. We organized in February, "Global Health Summit; TICAD, G8 and beyond" with World Bank and other leading agencies on Global Health. The program could be seen through our website. To disseminate our core messages, we published them as an article in Nikkei Shinbun, leading press widely read by business sector of Japan. I hope you will enjoy and support our messages. Now appears in English. Week of Africa: A day with Jeffrey Sachs, Bono and Tony Blair. The public relations of "Table For Two" activity which I am also involved was held in Diet Member’s office welcoming Dr. Jeffrey Sachs. It is a wonderful thing that social entrepreneurial activity like this originated in Japan and is spreading to the world into a movement that works on problems of scarcity of food on one side of the world and overeating on the other. I encourage you to participate. I went to Keio University in the afternoon. Various events are being held on its 150th anniversary this year. There was a presentation of a degree of "Doctor of Law" to Mr. Bono of Rock band U2 (Photograph 1 to 3) followed by commemorative speech. 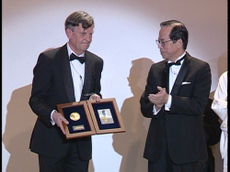 The award presentation ceremony was held at the auditorium, a prestigious place for Keio University, which was built by the initiative of Yukichi Fukuzawa, the founder of Keio. 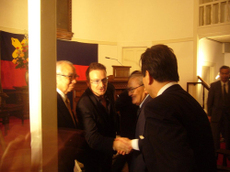 I was invited to this ceremony by Mr. Bono. 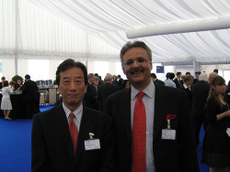 Ever since our meeting in the Davos Forum this year I am helping him along with Dr. Sadako Ogata and others. 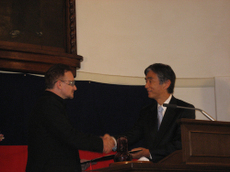 Photo1 Mr. Bono, at the presentation of ‘Doctor of Law’, and Dr. Anzai, the President of Keio University. 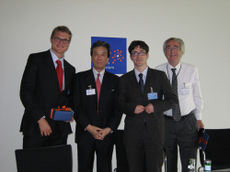 Photo3 Jeffrey Sachs also participated. The speech was a series of lectures on Shibusawa Ei’ichi memorial lectureship of Keio University that promotes the movements of "Civil Society." Then, I went to a meeting with the staffs of Mr. Tony Blair, the former Prime Minister of UK, whom I have reported to you in my past column. These are all related to Tokyo International Conference on African Development (TICAD) that will start in Yokohama this week and Toyako G8 Summit in July (Reference 1 TICAD, 2 Toyako Summit). Attention and expectations for Japan are very high. 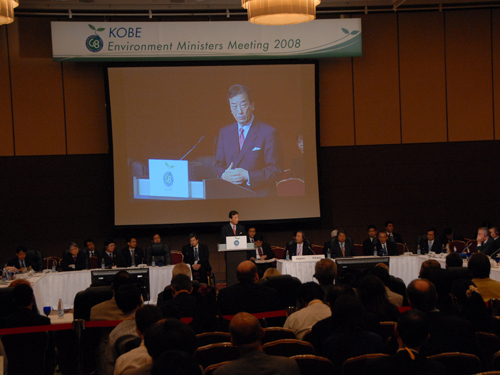 I was invited to deliver Opening Keynote to the G8 Environment Ministers’ Meeting in Kobe , May 24th. 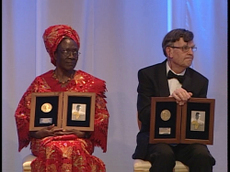 What an honor and privilege! But then a headache. I was told simultaneous translations to Japanese, English, French, Chinese and Spanish was scheduled. So, I decided to prepare my speech in English and deliver it in English. When you listen to any speech through simultaneous translation, simply it is difficult and frustrating because translation is always, by its very process, a bit behind the actual speech, sometimes few words are obviously missing, thus you are not sure to what extent the translation is correct. But of course unless you understand many languages almost perfectly, this process is unavoidable in international meetings. Thus, I prepared my entire speech after a few editing and reading myself, I sent my text to translators assuring in a memo that I will read the text so that you just follow in the language you are supposed to translate. No power-point slides, of course. I felt really good after I finished my speech, when UK Minister Honorable Hilary Benn came to me at the podium and told me it was very well thought-out, constructed, and well delivered, and he was very impressed. Wow! such comments by a British political leader, a real native English speaker. We chatted for a few minutes at the podium. 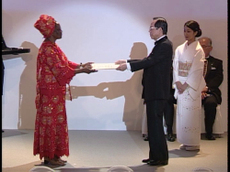 Thank you, Honorable Minister Kamoshita giving me this honor and privilege. But three days must have been very hard for you all. I left Kobe immediately and back to Tokyo to see Dr. Pachauri , Chair of IPCC, you know who he is. We met in New Delhi this February. 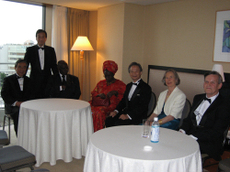 United Nations University(UNU) with its Institute for Advanced Studies(IAS) hosts a series of lectures "G8 Dialogue" in support of the role of Japan, that hosts 4th TICAD(Tokyo International Conference on African Development) in later this month in Yokohama and G8 Summit in Toyako, Hokkaido, early July. I was invited to talk on Global Health and its excerpt is attached for your interest. The lecture can be viewed on the web. Global Financial Crisis. Lessons from Japan? It is said more often than not, Japan is not clearly visible, particularly in last decade or so, in global scene be it domestic issues, and internationally and globally relevant issues. Sometimes, messages may appear from government officials in some critical issues defending their own position when questioned by the foreign press, but such messages could be one-sided. It is very important that more voices have to be expressed from independent parties and individuals, particularly opinions that may be against, but maybe more rational, prevailing views reported in Japan. Such voices will provide better and balanced understanding of Japan. In a recent Financial Times, one of the most widely read newspaper throughout the world, Professsor Sadatoshi Ito of Tokyo University, also a member of Economic and Fiscal Policy of the Government, contributed an article on recent global financial crisis triggered by the US subprime-loan and commented on arguments by some Japanese leadership that lessons could be learned by US from Japan on what Japan had taken over a decade 90’s until recently to respond to burst of bubble economy. Professor Ito clearly makes a point commenting the more rational and fast responses by US private sector and the government, demonstrating clear resilience of the nation. 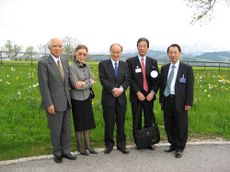 Leaders and members of every sectors of the society of Japan follows the act of Professor Ito to express their own opinions to the world as appropriate otherwise Japan remains insular, irrelevant and incomprehensible to the rapidly globalizing world affairs as you see many places in this website. A recent report on Newsweek,"This Nation Is An Island”, delivers as its core message how insular Japanese mind-set has been and remain to stay every sector of Japanese society. The message resonate well with previous reports by some of major foreign journals (examples include 2008/02, 2007/12) as well as some of recent books by several Japanese authors some of which were referenced in my recent book in Japanese "Innovation shiko-ho" or "Think of Innovation." 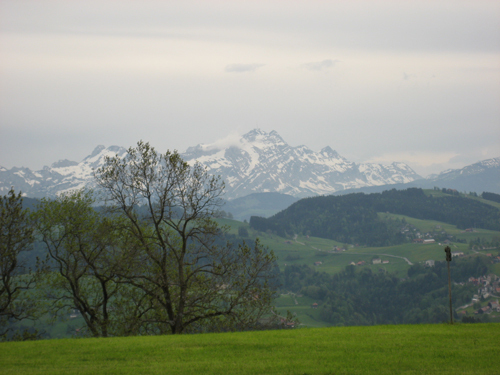 I share this view and you can see many places in this blog. This report strong argues that Japan remains in essence as always over centuries and continues to be closed, off-limit to foreigners and Sakoku and withdrawn from the rest of the world even this era of flattening globalized world. It is too sad to see Japan not to engage in the global world since there are great talents with vast opportunities for Japan to be a participant and a player of the world action and in pursuit of new world order for our common good. Mind you, Japan is still number two economy of the world. We need more entrepreneurs who think locally (local values and uniqueness) but act globally. 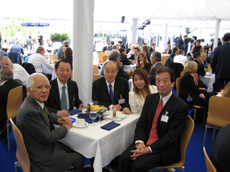 Have you seen recently a business people who remind us Morita-san of SONY of 1960s? Technology alone is not enough. It is an entire business enterprise that enables to capture the hearts of many people of the world. A little while ago, "Informal talk on global warming issue" was held at The Windsor Hotel at Toyako on Friday, April 5th, where G8 summit will be held in this July. The Prime Minister, Minister of Economy, Trade and Industry and Minister of the Environment participated. The chairperson was Mr. Okuda from Toyota. I arrived late at night on the previous day. Next day the weather was nice. The view of Toya Lake from the hotel was excellent. What would be the number of hotels around the Toya Lake and how about its quality? How many people would be present including the attendants and the press people? 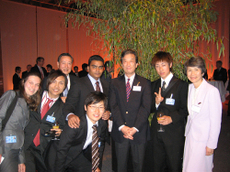 Recently, in international meetings like G8, not only the people related to the government but also people related to NGOs participate in large numbers. Though the participation patterns are different, it is not like guerrilla style. If such a large number of participants are expected, will Sapporo be used for lodging? It may be somewhat inconvenient isn’t it? 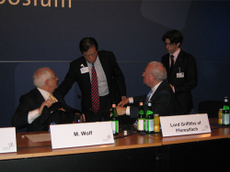 Not only G8, but heads of other countries including G5 will also participate. The President of the People’s Republic of China, Hu Jintao, who is visiting Japan now will of course participate. Moreover, there will be a large number of people in secret service etc..
Is the security of the meeting place and surroundings good? The approach to the hotel is only one though ・・・. Of course both police and self defense forces are working together hard and repeating simulation, but since the head of many countries will be participating, it’s easy to assume each country is collaborating with Japan on one side and on the other hand they work out their own security separately. It is unthinkable to rely complete security and safety of the chief of the state completely on the host country. As reported before, the first half of the Golden Week passed restlessly as always. On the 6th, the Ambassador of Finland and I participated in Prof. Yoko Ishikura’s class on "competitiveness" held at Hitotsubashi University business school. In the beginning, Prof. Ishikura raised the key important issues and then we discussed the issues. The students were raising their hands and expressing their views enthusiastically. They were expressing their own variant opinions and it was really a constructive and good time. All lectures here are in English and around 70% of students are from overseas. The faculties can view typical businesses in the world through the internet, by using "Harvard Business School" as a hub and the evaluations of the faculties are also done in common way. Given such open evaluation, it would be hard for the faculties but they can be motivated by referring to the lectures conducted by many faculties all over the world. Though challenging for the faculties they have no reasons to complain. It’s true, this is the scary part in the internet era, but it is also a pleasure to compete with global standards. Are there any such universities elsewhere? If not this way, universities in Japan cannot gather brilliant youngsters from all over the world since information is shared by everybody in this "flat" era. University faculties, I beg you all earnestly to work hard. After the class, we spent time on lounge, enjoying wine happily and talking with the students of various countries, such as India, US, Bangladesh, Russia, Myanmar, Poland, Uzbekistan, Thailand, and Vietnam etc.. I wish to express my gratitude for the wonderful hospitality. An article with full of suggestions and a recent comment by Prof. Ishikura about the ideal way and the evaluation of the higher education in the global age is available on her blog. 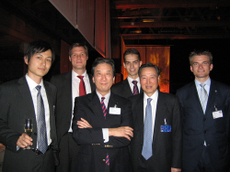 Chairman of the institute, Mr. Takeuchi Hirotaka, his policy is very strict from the beginning, however it’s really remarkable. By the way, a follow-up on this is available(in Japanese) in Prof. Ishikura’s blog. Please go through it.